My brother suggested that I write this tale which is recorded in the annals of Wray family history as the greatest fart story ever told! He feels that the post would be quite funny, but I fear it is one of those things where you had to be there, or you have to be a 12-year-old boy to appreciate it. In any case, this will not win me a pulitzer prize for blogging. 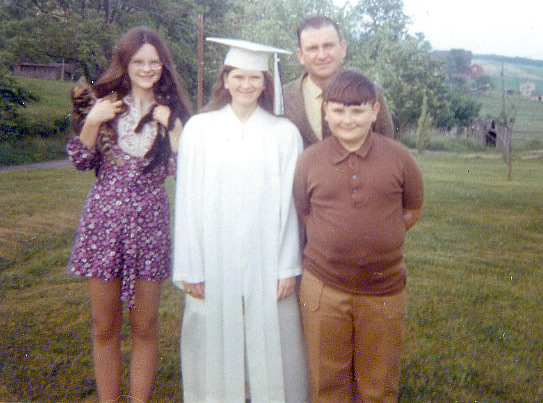 My sister, Kathi, had recently graduated from high school in 1971 when she answered a classified ad for what turned out to be a direct-sales pyramid scheme. Before she could wiggle out, the lady from Best Products talked her into having a demonstration party. On the appointed night, my parents fled the house, leaving my sister to host a party with an assortment of Aunts and cousins. Kathi was rightfully apprehensive about her younger brother and sister's behavior. I was 14 years old and my brother Dan, age 11, was known to create a ruckus fairly regularly. But we promised to be on our best behavior if she would allow us to sit in on the demonstration. In the days before internet and satellite TV, this promised to be high entertainment for two country kids. True to our word, when the guests arrived, Dan and I took our seats in the living room, all scrubbed, combed, and sitting up straight. We were determined to be good and not embarrass Kathi. The lady from Best laid out an assortment of household cleaning products on a card table and began her presentation. Dan and I were the models of good behavior. After the party, the guests soon departed. Kathi had stepped out of the room while the Best lady stowed her wares. Dan and I were still in the living room, quite relieved to have pulled off the event without a social faux pas, when an internal disturbance began to vex my brother. Afraid to get up from his seat, he struggled to contain the threatening eruption. What happened next is the stuff of legend. It began as a single, fairly quiet "putt" which made my brother laugh, causing another slightly louder "putt," which made him laugh even harder, and on and on in circular fashion until it sounded like Elmer Fudd was firing a machine gun in our living room. If this had occured under different circumstances, my brother would have taken great pride in his accomplishment, for the net effect was a production so spectacular in both duration and volume that all subsequent flatulence would be judged by comparison. Mortified and hysterically amused, Dan and I ran for my bedroom, leaped onto my bed, and convulsed in giggles! Oh dear, the odor he must have left behind. We wondered if the Best lady had a product to combat it. When we finally stopped laughing long enough to discuss the situation, Dan said we should return to the living room, because otherwise "it would be rude." So out we went again, shame-faced and quiet, and resumed our places. The Best lady pretended not to have noticed, which is like General Custer not noticing the hail of arrows. But try as we may, with every ounce of willpower, Dan and I could not maintain the facade, and ran off once again to my bedroom to erupt in laughter. Kathi returned to the room in time to pick up the telltale odor that told the whole story. She was highly embarrassed at the time, but later got quite a few giggles out of the episode. She had no interest in working for Best Products after hearing the spiel, so would never become "The Lady from Best."